The term biofuel is referred to as liquid or gaseous fuels that are produced from biomass. Biofuel is generally considered as offering many priorities, including sustainability, reduction of greenhouse gas emissions, regional development, social structure, agriculture and security of supply. A variety of biofuel can be produced from biomass resources including liquid fuels, such as ethanol, methanol, biodiesel, Fischer-Tropsuch diesel; and gaseous fuel, such as hydrogen and methane. Liquid biofuel is primarily used to fuel vehicles, fuel engine or fuel cell for electric generation. It can also be used for lighting and cooking proposes by using lamps and cooking stoves. There are several reasons for biofuel to be considered as relevant technologies by both developing and developed country. They include energy security region, environmental concern, foreign exchange saving, and socioeconomic issues related to the rural sector. 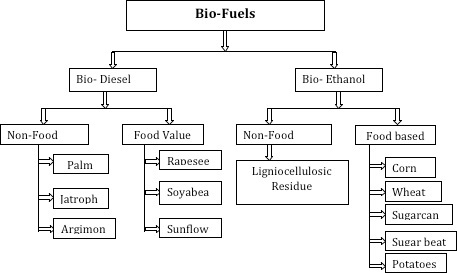 Advantages of biofuel are the followings: a) biofuel is easily available from common biomass sources (b) biofuel has considerable environmental friendliness potential (c) there are many benefits to the environment, economy and consumers in using biofuel, and (d) they are biodegradable and contribute to sustainability. Energy has taken a central role in the global economic development in the past and will continue to be so in the future. The global energy scenario has undergone a drastic change in last few decades. Due to ever-growing demand and shortage of supply, the cost of fossil fuel is mounting day by day. The excessive use of fossil fuels, incessant global demand and record high oil prices have triggered an urgent search for an alternative to fossil fuels for a world dangerously dependent on oil supplies and deeply alarmed by the effects of global warming. Different sources of liquid bio-fuel thus, have been indentified, which have several advantages such as the possibility to be produced locally, environment friendly, less costly and capable to perform equivalent to petroleum fuel. The energy experts have carried out the extraction of bio-diesel from the Jatropha seeds. The cultivation of Jatropha as a source of bio-diesel has several benefits in Nepal where economy is based mainly on agriculture. It can solve the unemployment crisis considerably and also ensures the utilization of degraded land and optimal usage of arable land. Besides this, Jatropha oil is superior to other oils as it has a short gestation period, easy handling, high oil extraction and superior quality of bio-diesel. A number of plantation practices and engine test runs have been conducted across the world and also in Nepal, which have been successful to demonstrate it as alternative to conventional fossil fuel. Therefore, the use of bio-fuel in the rural area for fulfilling energy requirement in Nepal has high possibility and potentialities. For this reason, Jatropha curcas is an attractive crop and it is being introduced rapidly in various rural programmes, as it may contribute to rural development by income generation and increasing the efficiency of rural and agricultural processes. In the context of Nepal, highly fragile and rolling hills prone to high soil erosion, declining availability of agriculture labor, high dependence on imported fossil fuel in one hand, and strong community managed forestry in the other; Jatropha has enormous potential to propagate. Government of Nepal has been implementing National Biofuel Program since the fiscal year 2008/09 by focusing particularly on promotion of Jatropha Curcas for the production of biodiesel in a country where AEPC has been taking a leading role.